HUBLI: Former Union Minister Sarojini Mahishi said here on Wednesday that it is preposterous to say that problems will arise if the recommendations made by the committee headed by her (on jobs for Kannadigas) are implemented. Ms. Mahishi, who was here to release a book on Siddharoodha Swamiji, told presspersons that problems are bound to arise when recommendations of committees are implemented. “You need to make some changes to recommendations if the need arises. If there is any impediment during implementation, it can be sorted out,” she said. “Nearly two decades have passed after the submission of the report. Things have changed a lot and some changes need to be made while implementing the report,” she said. Reiterating her stand that posts have to be reserved for Kannadigas, she said the committee has not recommended jobs for Kannadigas who are not eligible. “What we have said is that qualified Kannadigas should be given a job,” Dr. Mahishi said. To a question, she said there were four retired IAS officers in the committee headed by her, and every recommendation was carefully drafted after giving attention to details. Dr. Mahishi said she does not want to draw inferences with the regard to implementation of the committee’s final report that was submitted in 1986. She said she has discharged her duties and it is for the Government to take action. suvarna sambrama hana sangrahadha vichaaradalli dayavittu nivellaru sahaaya maadi. dayavittu neevella sahakarisi… sadhyakke nimmindha eshtu aaguththo astu hana kottare olleyadhu.. nanthara nimma snehitharindha sangrahisidha hana kodi…..
even 100 rupees from ten kannadigas will make 1000 rupees. 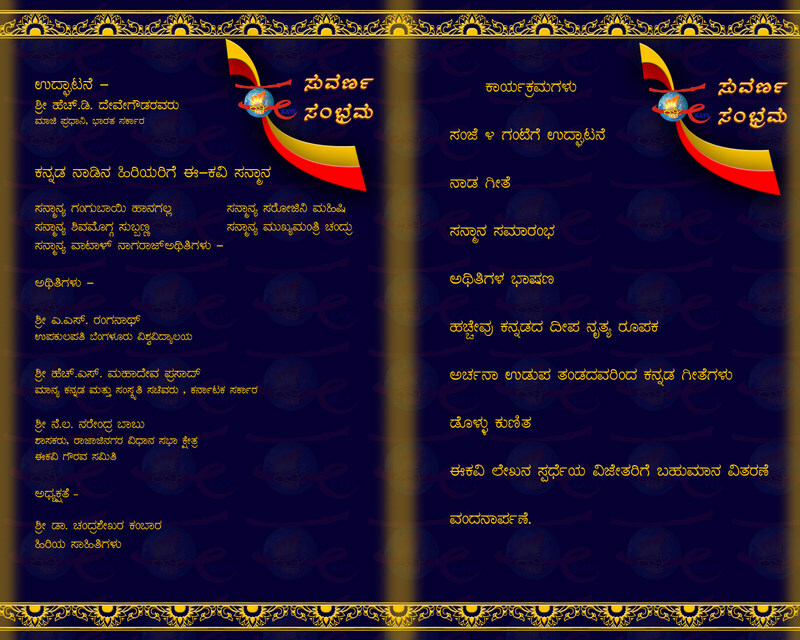 Needs help in collecting funds for EKAVI SUVARNA KARNATAKA PROGRAM. 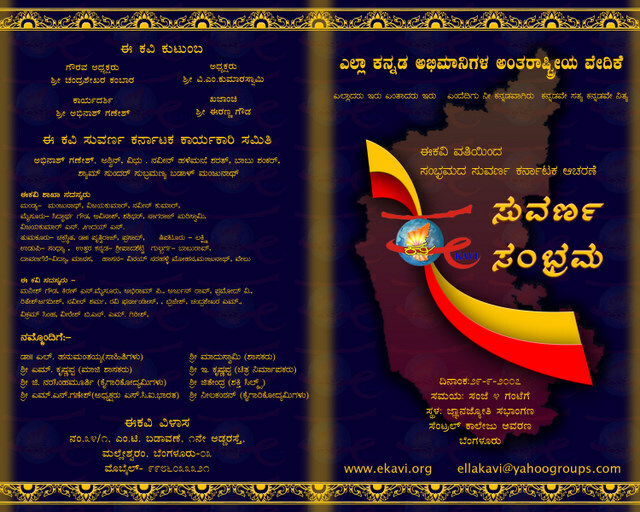 EKAVI needs help in collecting funds for EKAVI SUVARNA KARNATAKA PROGRAM. EKAVI SUVARNA KARNATAKA PROGRAM is on September 29th 2007. Place: jnana joythi auditorium. Central College Campus, Banaglore. Kannadigas can transfer funds directly through the bank. Make checks payable to: EKAVI Trust Regd. EKAVI also collected funds for Cine Actor Sri Ashwath. EKAVI has adopted Schools under Govt. of Karnataka School adoption program and distributed Scholarships and Materials to students. EKAVI Suvarna Karnataka Program ge support maadi mattu EKAVI is requesting Kannadigas come forward and help. Kannadigas who wants to support can transfer funds directly through the bank. J®è PÀ£ÀßqÀ C©üªÀiÁ¤UÀ¼À CAvÀgÁæ¶ÖÃçAiÀÄ ªÉÃ¢PÉ-FPÀ«. ¥ÀÇtðZÀAzÀæ vÉÃd¹éUÉ £ÀÄr £ÀªÀÄ£À: vÉÃd¹éAiÀÄªÀgÀ AiÀiÁªÀÅzÁzÀgÀÆ MAzÀÄ PÀÈwAiÀÄ£ÀÄß Dj¹PÉÆAqÀÄ CzÀ£ÀÄß ¤ÃªÀÅ KPÉ ªÉÄaÑPÉÆArj JAzÀÄ 500 ¥ÀzÀUÀ¼À£ÀÄß «ÄÃgÀzÀAvÉ ¯ÉÃR£ÀªÀ£ÀÄß §gÉAiÀÄ¨ÉÃPÀÄ. PÀ£ÀßqÀ £ÁqÀÄ £ÀÄr d£À ¸ÀA¸ÀÈw §UÉÎ PÀªÀ£À ¸ÀàzsÉð: PÀªÀ£ÀªÀÅ £ÀÆgÀÄ ¸Á®ÄUÀ¼À£ÀÄß «ÄÃgÀzÀAwgÀ¨ÉÃPÀÄ. J°èAiÀÄÆ ¥ÀæPÀlªÁVgÀ¨ÁgÀzÀÄ. PÀ£ÀßqÀzÀ ¥ÀæUÀwUÁV £ÁªÉÃ£ÀÄ ªÀiÁqÀ¨ÉÃPÀÄ: PÀ£ÀßqÀzÀ ¥ÀæUÀw¥ÀxÀªÀ£ÀÄß ºÀÄlÄÖºÁPÀÄªÀ ¸À®ÄªÁV PÀ£ÀßrUÀgÁzÀ £ÁªÉÃ£ÀÄ ªÀiÁqÀ¨ÉÃPÀÄ JAzÀÄ JgÀqÀÄ ¥ÀÅl «ÄÃgÀAzÀAvÉ ¥Àæ§AzsÀ gÀÆ¥ÀzÀ°è §gÉAiÀÄ¨ÉÃPÀÄ. PÀ£ÀßqÀ PÀxÁ ¸ÀàzsÉð: AiÀiÁªÀÅzÁzÀgÀÆ ¸ÁªÀiÁfPÀ ªÁ¸ÀÛ«PÀ CA±ÀUÀ¼À£ÉÆß¼ÀUÉÆAqÀ ªÀÄÆgÀÄ ¥ÀÅlUÀ¼À «ÄÃgÀzÀ PÀxÉUÀ½UÉ ¸ÁéUÀvÀ. J°èAiÀÄÆ ¥ÀæPÀlªÁVgÀ¨ÁgÀzÀÄ. DAiÉÄÌAiÀiÁzÀ §gÀºÀUÀ¼À£ÀÄß ¥ÀÅ¸ÀÛPÀ gÀÆ¥ÀzÀ°è ¥ÀæPÀn¸À¯ÁUÀÄªÀÅzÀÄ. §ºÀÄªÀiÁ£ÀUÀ¼À£ÀÄß ¸É¥ÀÖA§gï 29, 2007gÀAzÀÄ, ¸ÉAlæ¯ï PÁ¯ÉÃf£À DªÀgÀtzÀ°è £ÀqÉAiÀÄ°gÀÄªÀ ¸ÀÄªÀtð PÀ£ÀßqÀ PÁAiÀÄðPÀæªÀÄzÀ°è ¤ÃqÀ¯ÁUÀÄªÀÅzÀÄ. §gÀºÀUÀ¼ÀÄ ¸ÀÄálªÁVgÀ¨ÉÃPÀÄ. ¸ÁzsÀåªÁzÀ°è mÉÊ¥ï CxÀªÁ rn¦ ªÀiÁrgÀ¨ÉÃPÀÄ. AiÀiÁgÀÄ JµÀÄÖ ¸ÀàzsÉðUÀ¼À°è ¨ÉÃPÁzÀgÀÆ ¨sÁUÀªÀ»¸À§ºÀÄzÀÄ. «zÁåyð «¨sÁUÀUÀ¼À°è ¨sÁUÀªÀ»¸ÀÄªÀªÀgÀÄ «zÁå¸ÀA¸ÉÜAiÀÄ ªÀÄÄRå¸ÀÜjAzÀ ¥ÀqÉzÀ zsÀÈrüÃPÀgÀt ¥ÀvÀæªÀ£ÀÄß ®UÀwÛ¸À¨ÉÃPÀÄ. E ªÉÄ¬Ä¯ï «¼Á¸À EªÀÅUÀ¼À£ÀÄß vÀ¥ÀàzÉÃ £ÀªÀÄÆ¢¸À¨ÉÃPÀÄ. ¥ÀæPÀlªÁUÀzÀ §gÀºÀUÀ¼À£ÀÄß AiÀiÁªÀÅzÉÃ PÁgÀtPÀÆÌ »A¢gÀÄV¸À¯ÁUÀÄªÀÅ¢®è. §gÀºÀUÀ¼À£ÀÄß £À«Ã£ï ºÀ¼ÉÃªÀÄ£É, 88, L¹J¥sóïJL £ÁåµÀ£À¯ï PÁ¯ÉÃdÄ, 6 ªÀÄvÀÄÛ 7£ÉÃ CqÀØgÀ¸ÉÛUÀ¼À £ÀqÀÄªÉ, ¸ÀA¦UÉ gÀ¸ÉÛ, ªÀÄ¯ÉèÃ±ÀégÀA, ¨ÉAUÀ¼ÀÆgÀÄ-560003 CxÀªÁ zÀÆgÀªÁtÂ: 9901399318 E°èUÉ ¸É¥ÀÖA§gï 2೪, 2007gÉÆ¼ÀUÉ vÀ®Ä¥ÀÅªÀAvÉ PÀ¼ÀÄ»¸À¨ÉÃPÀÄ.